These slate tiles had been laid in the kitchen of a farmhouse in the village of Little Hampden around twenty years ago and since that time had become heavily soiled with a build-up of dirt and over applied sealants. To get the floor clean a strong dilution of Tile Doctor Pro-Clean was applied to the floor, allowed to soak in for a while and then scrubbed into the tile and grout with the aid of a commercial rotary machine. Once done the floor was washed down with water which was then removed along with the soiled cleaning solution using a wet vacuum. The Pro-Clean removed the top soiling throughout the floor but it became clear that something stronger would be need to remove the heavy build-up of old sealants. Fortunately we have a product called Tile Doctor Remove and Go which is designed to strip floors of sealers so this was applied to the floor in a similar fashion as before and this tackled the problem. The next task was to clean the grout lines with Tile Doctor Grout Clean-up and give the whole floor a final rinse with more water to ensure any chemical residue is removed leaving the floor ready for sealing. The floor was left to dry overnight and I came back the next day to seal it to protect for years to come and improve the general look of the slate which really does look better when sealed. 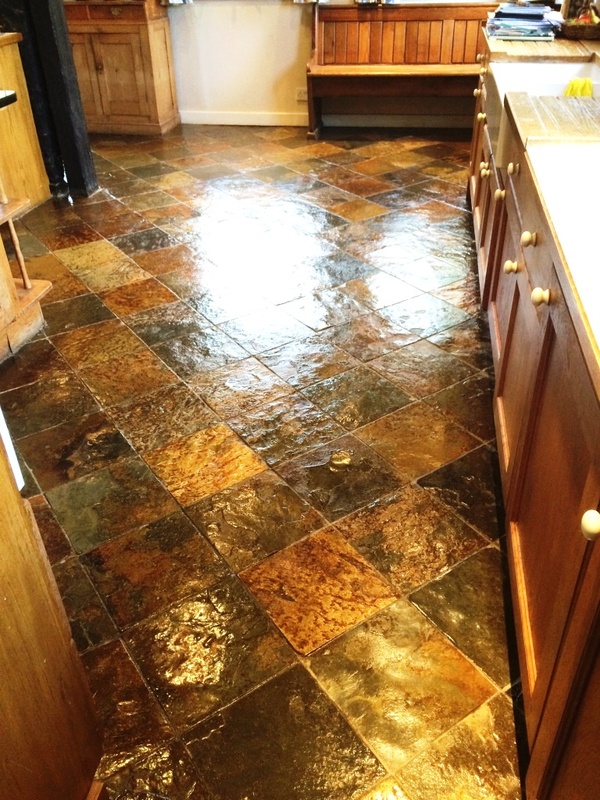 To seal the floor I used a combination of products to get the best results. First a coat of Tile Doctor Colour Grow was applied which is a colour enhancing impregnating sealant which occupies the pores in the stone protecting it from within and then a number of coats of Tile Doctor Seal and Go were added to add a nice subtle sheen to the floor. Our customer was extremely pleased with the results and took up our offer of a Tile Doctor maintenance contract to enable her to keep the floor in pristine condition. 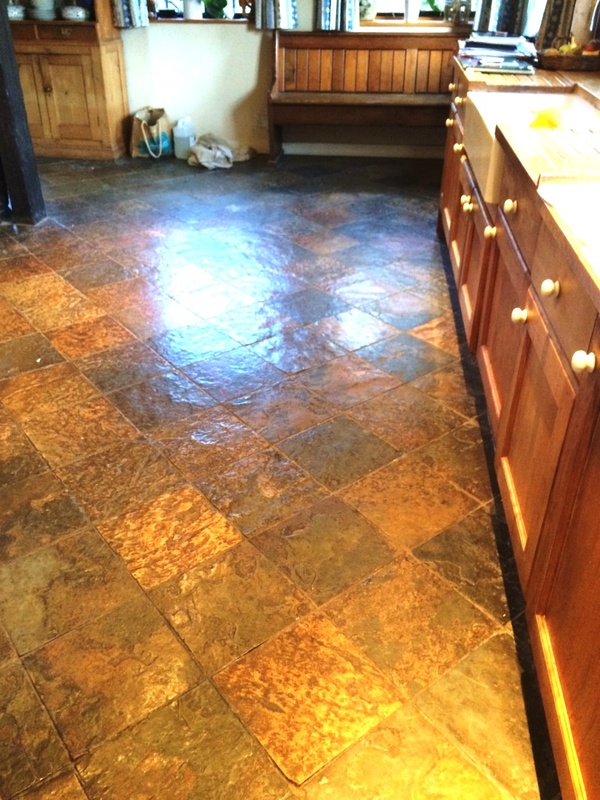 This entry was posted in Slate Tile Posts and tagged farmhouse, kitchen, Little Hampden, slate tiles, south buckinghamshire, tile cleaning, tile sealing by AbzDominise. Bookmark the permalink. Now all the old coatings have been thoroughly removed from the slate and its been resealed the customer should find its much easier to keep clean.